Israeli forces continue systematic crimes in the occupied Palestinian territory (oPt) for the week of 04 – 10 May 2017. Israeli forces executed a Palestinian girl in occupied Jerusalem, while 24 Palestinian civilians were wounded during peaceful protests in the occupied West Bank. Among the wounded were 2 children and 5 photojournalists. Israeli forces also continued to target the Gaza Strip border areas, but no casualties were reported. However, an Israeli agricultural aircraft reportedly sprayed fertilizers over agricultural lands along the border fence, to the south of the Gaza Strip. During the reporting period, Israeli forces killed a Palestinian girl in occupied Jerusalem and wounded 24 others, including 2 children and 5 photojournalists, in the West Bank. In the Gaza Strip, Israeli forces continued to pursuit the Palestinian fishermen in the sea and open fire at Palestinian farmers at the border areas. Protests in solidarity with the prisoners: 17 civilians were wounded, including 5 photojournalists. Two of them were wounded by live ammunition, 10 others were wounded by metal bullets and 5 were hit by gas canisters. Weekly protests against the annexation wall and settlement activities: 6 civilians, including 2 children, were wounded. Four of them were wounded by live ammunition, a civilian was wounded by metal bullets and another was hit by a sound bomb. Incursions: a civilian was wounded by metal bullets. In the Gaza Strip, concerning Israeli attacks on fishermen in the Gaza Strip sea, on 04 May 2017, Israeli gunboats stationed in the sea opened fire at the Palestinian fishing boats sailing within the allowed area, west of al-Sudaniya shore, west of Jabalia, north of the Gaza Strip. Other attacks recurred in the same area on 05 and 06 May 2017. However, neither casualties nor material damage were reported. On 06 May 2017, Israeli gunboats opened fire at fishing boats sailing within the allowed area off Khan Yunis shore, south of the Gaza Strip. Neither casualties nor material damage were reported. On 07 May 2017, Israeli gunboats opened fire at fishing boats sailing within the allowed area off Beit Lahia shore, north of the Gaza Strip. Similar attacks were carried out on 08, 09 and 10 May 2017. Neither casualties nor material damage were reported. In the context of targeting the border areas, on 09 May 2017, an Israeli aircraft sprayed pesticides over agricultural lands 400 meters to the west of the border fence, north of al-Qarara village, east of Khan Yunis, south of the Gaza Strip. It should be noted since the beginning of 2017, Israeli aircrafts spray pesticides over that area under the pretext of burning the bushes for security reasons. However, the pesticides cause damage to the farmers’ crops. During the reporting period, Israeli forces conducted at least 64 military incursions into Palestinian communities in the West Bank. During these incursions, Israeli forces arrested at least 58 Palestinian civilians, including 12 children. Nine of them, including 4 children, were arrested in occupied Jerusalem, while 4 others, including a child, were arrested while participating in a protest supporting the Palestinian prisoners. In violation of the international humanitarian law, Israeli forces stormed on 04 May 2017, Palestine Medical Complex in Ramallah. They opened fire randomly, due to which a number of patients, including children, suffered tear gas inhalation. In the Gaza Strip, on 07 May 2017, Israeli forces conducted an incursion into the east of al-Qarara village, northeast of Khan Yunis, south of the Gaza Strip. They levelled lands along the border fence for few hours and withdrew later. On the same day, Israeli forces moved into the east of al-Salqa valley, east of Deir al-Balah in the central Gaza Strip. They levelled lands as well and then withdrew. The illegal closure of the Gaza Strip, which has been steadily tightened since June 2007 has had a disastrous impact on the humanitarian and economic situation in the Gaza Strip. The Israeli authorities impose measures to undermine the freedom of trade, including the basic needs for the Gaza Strip population and the agricultural and industrial products to be exported. For 9 consecutive years, Israel has tightened the land and naval closure to isolate the Gaza Strip from the West Bank, including occupied Jerusalem, and other countries around the world. This resulted in grave violations of the economic, social and cultural rights and a deterioration of living conditions for 2 million people. The Israeli authorities have established Karm Abu Salem (Kerem Shaloum) as the sole crossing for imports and exports in order to exercise its control over the Gaza Strip’s economy. They also aim at imposing a complete ban on the Gaza Strip’s exports. The Israeli closure raised the rate of poverty to 65%. Moreover, the rate of unemployment increased up to 47% and youth constitutes 65% of the unemployed persons. Moreover, 80% of the Gaza Strip population depends on international aid to secure their minimum daily needs. These rates indicate the unprecedented economic deterioration in the Gaza Strip. On the same day, the Israeli municipality demolished an under-construction building in al-Tour village, east of occupied Jerusalem’s Old City. On the same day as well, the Israeli municipality demolished a house belonging to Ashraf Fawaqa in Sour Baher village, south of the city. On the same day, the Israeli municipality demolished 2 commercial facilities in al-Eisawiya village, northeast of occupied Jerusalem. In the context of Israeli settler attacks against the Palestinian civilians and their property, on 09 May 2017, settlers wrote curses against prophet Mohammed (pbuh) and racist slogans. They punctured also the tires of 17 cars in Shu’fat neighbourhood, north of occupied Jerusalem. The neighbourhood residents said the slogans were signed by the Israeli “Price Tag” organization. On 09 May 2017, Israeli forces demolished a house and a livestock barrack in al-Jiftlek village, north of Jericho. It should be noted the livestock barrack belongs to Najeh Ka’abna (48) while the house belongs to his son Ouda (20). On Thursday 04 May 2017, Israeli forces established 3 checkpoints at the entrances to Sa’ir and Beit ‘Awaa villages and at the northern entrance to Hebron. On Friday, 05 May 2017, Israeli forces established 3 checkpoints at the northern entrance to Halhoul village and the entrances to al-‘Aroub refugee camp and Ethna village. On Saturday, 06 ay 2017, 3 similar checkpoints were established at the northern entrance to Yatta village and at the entrances to Beit ‘Awaa and Karmah villages. On Sunday, 07 May 2017, Israeli forces established 3 checkpoints at the entrances to al-Fawar refugee camp, Samou’a village and Beit Ummer village. On Tuesday, 09 May 2017, Israeli forces established 4 checkpoints at the entrances to Beit ‘Awaa and Ethna villages; at the entrance to ‘Ain al-Maiyah road, east of Yatta; and at the northern entrance to Hebron. On Thursday, 04 May 2017, Israeli forces established 3checkpoints at the entrance to Ras Karkar village, west of Ramallah; at the entrances to al-Nabi Saleh and Um Safa villages, northwest of the city. At approximately 15:30 on Friday, 05 May 2017, Israeli forces established a checkpoint in ‘Atara village’s bridge, north of Ramallah. On Saturday, 06 May 2017, Israeli forces established 4 checkpoints at the entrance to Biteen village, northeast of Ramallah; at the intersection of ‘Ain Sinah village; in ‘Atara village’s bridge, north of Ramallah; and on al-Mo’arajat road between Jericho and Ramallah. On Sunday, 07 May 2017, Israeli forces established 3 checkpoints at the entrances to ‘Ain Yabroud and al-Nabi Saleh villages and at the intersection of Shaqbah village, northwest of the city. At approximately 18:30 on Tuesday, 09 May 2017, a similar checkpoint was established in ‘Ain Yabroud village’s bridge, northeast of the city. On Saturday, 06 May 2017, Israeli forces established 3 checkpoints at the northern entrance to Jericho (was established twice); and at the intersection of al-Jeftilik village, north of the city. On Sunday, 07 May 2017, Israeli forces established 2 checkpoints at the southern entrance to Jericho and at the northern entrance to the city. On Saturday, 06 May 2017, Israeli forces established 2 checkpoints at the entrance to ‘Azoun village and at the northern entrance to Kafur Thulth village, east of Qalqilyia. At approximately 18:50 on Saturday, Israeli forces established a checkpoint at the western entrance to Kaful Hares village, north of Salfit. At approximately 18:00 on Saturday, 06 May 2017, Israeli forces established a checkpoint at the entrance to ‘Asirah village, north of Nablus. They stopped Palestinian vehicles and checked their IDs, but no arrests were reported. At approximately 10:30 on Thursday, 04 May 2017, Israeli forces established a checkpoint on ‘Atara Village Bridge, north of Ramallah. They stopped Palestinian vehicles and checked the passengers’ IDs, during which Taha Hussain ‘Odah al-Barghwthi (30), from Deir Abu Mish’al village, northwest of the city was arrested. It should be noted that Taha is a former prisoner who served 2 years in the Israeli jails. At approximately 17:00 on Thursday, Israeli forces stationed at Hawarah checkpoint, south of Nablus, arrested Nidal Nadir Suliman (36), from Kafur Qalil village, southeast of the city. Eyewitnesses stated that the Israeli forces stopped the vehicle carrying Nidal and checked the passengers’ IDs before arresting him. At approximately 18:00 on Friday, 05 May 2017, Israeli forces stationed at Za’tara checkpoint, south of Nablus, arrested Mansour Farraj Mansour Farraj (20), from Balatah camp, east of the city. Eyewitnesses stated that the Israeli forces stopped the vehicle carrying Farraj and checked the passengers’ IDs before arresting him. At approximately 19:35 on Friday, Israeli forces established a checkpoint at the entrance to Jinasafout village, east of Qalqilyia. They stopped Palestinian vehicles and checked passengers’ IDs, during which ‘Esam Basem Mansour, from Deirsityia village, northwest of Salfit, was arrested. At approximately 23:50, ‘Esam was released. At approximately 08:00 on Saturday, 06 May 2017, Israeli forces stationed at Beit Foreek checkpoint, east of Nablus, arrested ‘Akramah Bassam Hilal Khatatbah (18). Eyewitnesses said that the Israeli forces stopped Palestinian vehicles and checked passengers’ IDs before arresting ‘Akramah. At approximately 14:30 on Sunday, 07 May 2017, Israeli Border Guard officers stationed at military checkpoints in the vicinity of al-Ibrahimi Mosque in Hebron’s Old City, arrested Mahmoud Ahmed al-Rajbi (23). Mahmoud was then taken to “Kriyat Arba’” settlement, east of the city. At approximately 13:30 on Tuesday, 09 May 2017, Israeli forces established a checkpoint at the entrance to Dair Abu Mish’al village, northwest of Ramallah. They searched Palestinian civilians’ vehicles and checked their IDs. During which, ‘Adil Haytham Abed al-Latif (16), from the abovementioned village, was arrested and then taken to an unknown destination. As part of the Israeli policy to use excessive and lethal force against Palestinian civilians, who are suspected by Israeli soldiers of intending to carry out stab attacks against the soldiers, on Sunday, 07 May 2017, Israeli forces killed a girl at the southern entrance to the Damascus Gate “al-‘Amoud” in occupied East Jerusalem’s Old City. The Palestinian Center for Human Rights (PCHR) strongly condemns this heinous crime. 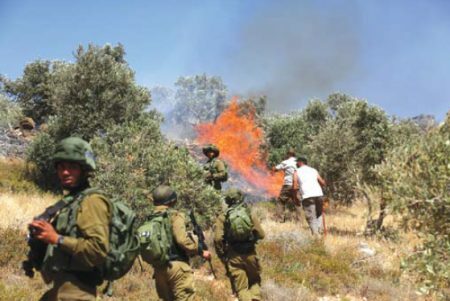 PCHR stresses this crime was committed after the Israeli political and military leaders gave the Israeli soldiers the green light to shed the Palestinian blood in light of the international community’s policy to tolerate Israel for crimes committed by the Israeli soldiers against Palestinian civilians. According to PCHR’s investigations and testimonies by eyewitnesses to PCHR’s fieldworker in occupied Jerusalem, at approximately 19:00 on the abovementioned day, Fatmah ‘Afif ‘Abdel Rahman Hjeiji (16), from Qarawet Bani Zaid village, northwest of Ramallah, was walking 10 meters away from a police checkpoint, which is permanently established at the southern entrance to the Damascus Gate. One of the soldiers suddenly screamed out, “knife”. Immediately, the Israeli soldiers stationed there opened fire at the girl. As a result, 30 live bullets hit her body; some of them penetrated her chest and waist from the right side. Therefore, Fatmah was killed on the spot. Eyewitnesses emphasized that after the girl fell on the ground, the Israeli soldiers continued shooting at her and not only attempting to wound or arrest her. Following this, the Israeli police deployed in the area closed the scene and prevented anyone from approaching the girl, whose body had been on the ground for an hour. The police officers attacked and pushed dozens of civilians away. They chased Mahmoud Abu Sbeih (9) until he fell from height in the Damascus Gate area and was then taken to the hospital to receive medical treatment. At approximately 00:00 on Sunday, 07 May 2017, Israeli forces moved into al-Sawwanah village, east of occupied East Jerusalem’s Old City. They raided and searched a house belonging to Saleem al-Shalabi and arrested his son, Nour (17). At approximately 01:00 on Monday, 08 April 2017, Israeli forces moved into neighborhoods in occupied East Jerusalem’s Old City. They raided and searched houses from which they arrested Waheeb ‘Emran Qutob (17), Mohamed Najeeb (23), ‘Alaa Najeeb (21), Mohamed Bayoumi (20) and Abdullah al-Joulani (21). At approximately 01:00 on Monday, 08 May 2017, Israeli forces moved into Swayeh neighborhood in Silwan village, south of occupied East Jerusalem’s Old City. They raided and searched a house belonging to Sa’eed ‘Aiyash (65) and arrested him. It should be noted that Sa’eed is father of Milad ‘Aiyash (15), who was killed by Israeli forces in mid-May 2011. Wa’ed Aiyash said that the Israeli forces and Intelligence officers raided her family house and informed father that he’s under arrest. Wa’ed also said that the Israeli forces prevented her father from calling his lawyer and even from taking his medicine. She added that yesterday early morning the Israeli forces raided their house to arrest her father, who was at the hospital receiving medical treatment. At approximately 03:00 on Tuesday, 09 May 2017, Israeli forces moved into al-Shiekh Sa’d village, southeast of occupied Jerusalem. They raided and searched houses from which they arrested Qusai Mohamed Hasan Mashahrah (20) and his brother Ahmed (17); and ‘Asem Mohamed Ibrahim Mashahrah (20) and his brother Omar (16). At approximately 06:00 on Thursday, 04 May 2017, Israeli bulldozers demolished 3 houses in al-Waljah village, west of Bethlehem, under the pretext of non-licensing within the area belonging to the Jerusalem munciplaity. The head of al-Waljah village council, Khadir al-‘Araj, said that the Israeli forces demolished a 2-storey-house built on an area of 400 square meters. The abovementioned house was inhabited and belongs to Ibrahim Niroukh. Moreover, the Israeli forces demolished 2 houses belonging to Hamed and Rae’d Abu Sninah. Each of these houses was built on an area of 150 square meters. Al-A’raj said that during the past period, Israeli authorities had handed demolition notices for around 40 houses in the village in addition to 70 old others. At approximately 08:00 on Thursday, the Israeli Municipality crews demolished an under-construction residential building, east of occupied East Jerusalem’s Old City. The building belonging to Rami al-Sayad and Khalil Abu Sbitan was demolished under the pretext of non-licensing. While demolishing the building, Israeli forces arrested a Palestinian young man. Rami al-Sayad said that he along with Abu Sbitan built the residential building 8 months ago and were then forced to stop the construction works after the Israeli Municipality issued a demolition notice. He added that they attempted to obtain a licence for the building 4 months ago when their lawyer and engineer submitted the necessary papers before the competent departments. There was a preliminary approval on the building license and they paid NIS 20,000 for the municipality as a fine in addition to the lawyer’s and engineer’s The lawyer managed to delay the demolition decision until 01 May 2017 and tried to delay it for some time to come. However, due to the Jewish holidays, he failed. Al-Sayad added that the building is comprised of 2 floors; each of which has 2 apartments built on an area of 220 square meters. It should be noted that the construction cost was estimated at NIS 8,000. At approximately 10:00 on the same day, the Israeli Municipality demolished a house belonging to Ashraf Fawaqah on Qaisan Street in Surbaher village, south of occupied East Jerusalem, under the pretext of non-licensing. Fawaqah said that the Israeli bulldozers demolished his house build 6 years ago under the pretext of non-licensing. Fawaqah attempted many times to license the 100-square-meter house, which sheltered 6 persons, including 4 children. He added that the Municipality, Magistrate and District Courts approved the decision to demolish his house. He added that the Municipality Court decided at the beginning of last February to demolish the house without further extension, so his lawyer filed an appeal before the District Court, which delayed the decision to the beginning of March. At that time, the court imposed on him a fine of NIS 30,000 to delay the decision, in addition to the court fees. After judge refused the appeal, he considered the NIS 30,000 as costs to be paid for the municipality to demolish the house. He also paid a construction fine of NIS 60,000. In afternoon, Israeli bulldozers demolished 2 commercial facilities in al-‘Issawiyia village, northeast of occupied Jerusalem, under the pretext of non-licensing. Those facilities belong to Motee’a Naser Abu Riyalah. Member of the village follow-up committee, Mohamed Abu al-Humus, said that a large force of Israeli soldiers accompanied with 2 bulldozers moved into al-‘Issawiyia village and demolished 2 commercial facilities belonging to Motee’a Abu Riyalah. It should be noted that the abovementioned facilities were built on an area of 120 square meters. On Tuesday, 09 May 2017, Israeli forces accompanied with military vehicles, a vehicle belonging to the Israeli Civil Administration and a bulldozer moved into al-Jeftlik village, north of Jericho. They stationed in the centre of the village and then surrounded 2 barracks belonging to Najeh ‘Odah Ka’abnah (48) and his son ‘Odah (20). The Israeli forces demolished the 2 barracks under the pretext of non-licencing. Najeh Ka’abnah said that the 2 barracks were built of bricks and tin plates; the first 300-square-meter barrack belongs to Najeh and was used for livestock breeding while the second 200-square-meter barrack belongs to ‘Odah and his wife and is residential. At approximately 13:30 on Friday, 05 May 2017, a group of Israeli settlers gathered near Rawabi intersection, north of Ramallah. They closed the street and prevented Palestinian vehicles from passing. The Israeli settlers’ presence and closure of the street continued for 4 hours without any intervention from the Israeli forces, who were stationed in the area to secure the evacuation of the Israeli settlers. At approximately 08:30 on Sunday, 07 May 2017, a group of Israeli settlers from “Shilo” settlement accompanied with 2 bulldozers moved into agricultural lands belonging to the residents of Termas’iyia village, north of Ramallah. A number of the village residents headed to the area to hold the settlers off. As a result, the Israeli soldiers intervened to evacuate the settlers, who were in the agricultural lands. On Tuesday, 09 May 2017, Israeli settlers wrote racist slogans and insults against Prophet Mohammed in addition to puncturing vehicles’ tires in al-Sahel area in Sho’fat neighborhood, north of occupied East Jerusalem. The neighborhood residents said they were surprised the Israeli settlers’ sabotage while heading to perform Fajer prayer. The residents also said that the Israeli settlers wrote racist slogans and insults against Prophet Mohammed on walls and vehicles. They added that around 17 vehicles’ tires were punctured. These vehicles belong to ‘Isaa, Abu Zahra, Abu Khadir, Khaddour, ‘Abd al ‘Aal, al-Meshni and Ghoshah families. PCHR warns of the escalating settlement construction in the West Bank, the attempts to legitimize settlement outposts established on Palestinian lands in the West Bank and the continued summary executions of Palestinian civilians under the pretext that they pose a security threat to the Israeli forces. PCHR reminds the international community that thousands of Palestinian civilians have been rendered homeless and lived in caravans under tragic circumstances due to the latest Israeli offensive on the Gaza Strip that has been under a tight closure for almost 10 years. PCHR welcomes the UN Security Council’s Resolution No. 2334, which states that settlements are a blatant violation of the Geneva Conventions and calls upon Israel to stop them and not to recognize any demographic change in the oPt since 1967.